The 10 worst places to live in America as per WalletPop using a variety of criteria, including unemployment rates, health data, the number of foreclosures, crime statistics, climate and other measures of misery. High on the list and a common thread in many of these places is political corruption. Welcome to the home of the highest unemployment in the United States at 27.5%. OUCH! One in four people here are out of work and the city holds the not-so distinguished honor of having the highest unemployment rate — 27.5%. The desert city, which is located in Imperial County just across the border from Mexicali, has a jobless rate triple the national average of 9.5% thanks to the seasonal fluctuations of field laborers. Cleveland heads the Forbes list of “most miserable” US cities. What would Howard the Duck & Cherry Bomb say? LeBron James isn’t the only person leaving Cleveland. The U.S. Census estimated that 2,658 people left the city in 2009, the largest numerical drop among America’s major cities. Forbes also put Cleveland atop its list of most miserable U.S. cities, factoring in its high unemployment (although at 9.1% it’s below the national average), high taxes, lousy weather, political corruption and lousy sports teams — and that was before LeBron decided to leave. Cleveland also ranks in the top third of all metro areas for foreclosure rates. The city has thousands of abandoned homes, in part because it provided down payments through the federally-funded Afford-a-Home program to many people who could not afford their mortgage payments. Conveniently enough, Detroit is #4 with a bullet on Forbes “most miserable” city’s list. Check out the following VIDEO, “We Will Remember” from Haley Barbour and Republican Governors Association. Talk about a powerful and effective video documenting Obama’s regime and his henchman like Reid and Pelosi’s attempts to change the United States of America into something that no one voted for. Never has America seen such an assault on their economy, freedom and prosperity. Obama and his band of liberal Democrats looks to transform the United States into a socialist Western European country. Do not let them … stand up and Remember in November. Make a difference. We Will Remember from Republican Governors Association on Vimeo. As the Gateway Pundit states, Remember November so that we can return to the principles of Our Founding Fathers. Remember November so that we can return America to its founding principles of freedom, personal responsibility and economic liberty. 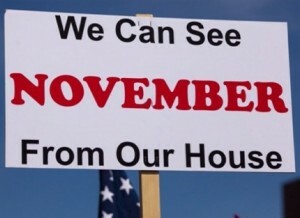 We Remember November so we, our children, and grandchildren can live with the freedoms our founding fathers intended. Add your name to the list HERE. Protein Wisdom comments on the LEFT’s reaction. To answer their question, Yes, they are that desperate. How absolutely pathetic Time magazine. Is the Left really this desperate? Is Scherer just trying to see how far he can dupe the Left into spreading such a ridiculous meme? I would venture the majority of TEA Party participants might vaguely recognize the name “Guy Fawkes” but not immediately recall the history. And Scherer makes his case for the Republican Governors “call to violence” from focusing more on how Fawkes’ story was adapted for the graphic novel turned into movie V for Vendetta — for most TEA Party participants, that itself would be even further from their attention. The LEFT is so hell-bent on comparing anyone who would dare oppose Obama, the Democrats and their socialist policies as terrorists. It is a tired, lame and self-defeating approach. It is quite a stretch that this video would some how allude to anti-government British terrorist Guy Fawkes. A stretch indeed. It can explain why independents have run from Obama and the Democrat party. People are sick of being demonized because they are the voice of dissent against Barack Obama. A dissenting public might I add that represents a majority of Americans. 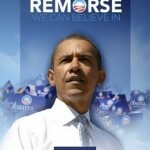 OBABA BUYER’S REMORSE … what is the return policy on Barack Hussein Obama? After less than one short year in office, actually with the socialism agenda rammed down the throats of American it was long, American voters have buyers remorse with Barack Hussein Obama. If the election were held today according to The Allstate/National Journal Heartland Monitor poll shows 50% say they would probably or definitely vote for someone else. The Allstate/National Journal Heartland Monitor poll shows 50% say they would probably or definitely vote for someone else. Fully 37% say they would definitely cast a ballot against Obama. Meanwhile, just 39% would vote to re-elect the pres. to a 2nd term, and only 23% say they definitely would do so. Obama’s first year in office has been marked by an unemployment rate that surged to 10%, an increased commitment of troops to Afghanistan and a health care battle that has taken a serious political toll on the WH. Obama’s approval rating is down to 47%, the poll showed, a 14-point drop since the April survey. 45% disapprove, up 17 points from April. Only 41% say they trust Obama more than Congressional GOPers, while 33% pick the GOP over the WH. That 8-point gap is down from a 21-point edge Obama sported as recently as Sept.
Just 34% say the country is moving in the right direction, down 13 points since April, and 55% say it is off on the wrong track, up 13 points over the same period. There is a reason why Barack Obama has a running double digit negative rating in the Rasmussen Presidential Daily Tracking poll for 51 straight polling days. Why should this be surprising when we have a President that has pretty much failed on ever thing, including going against the will of the people on health care? Why did this President make the government run of health care more important than jobs? Retail sales unexpectedly fell in December, leaving 2009 with the biggest yearly drop on record. Drip, Drip, Drip … More Rats Fleeing the S.S. Obama. More carnage in the Democrat party for the upcoming 2010 midterm elections. Long time Nutmeg State Democrat Senator Chris Dodd is to announce Wednesday that he will not seek reelection in 2010. The mortgage scandal plagued Senator found himself in real trouble and behind in the polls for reelection. Dodd’s retirement comes after months of speculation about his political future, and amid faltering polling numbers and a growing sense among the Democratic establishment that he could not win a sixth term. It also comes less than 24 hours after Sen. Byron Dorgan (D-N.D.) announced he would not seek re-election. The Countrywide mortgage scandal made Dodd, the Senate Banking Committee Chairman almost impossible to reelect. In the midst of a banking and mortgage fiasco, we have Dodd getting sweatheart deals. One has to wonder how viable a candidate is when they are behind in the polls to the wife of WWE owner, Linda McMahon. OUCH! Of course this is probably good news for Dems as Dodd did not have a chance in hell of winning. However, how much of Dodd’s corrupt sins will the new Democrat candidate have to overcome and pay for? It truely is D-Day for Democrats or as Another Black Conservative calls it, “Dead Men Walking”. My what a difference two years make, from 2008 where Dodd ran for the Democrat nomination for the presidency to out on his can in Connecticut. It is a sign of the times for Democrats as they scurry out of office before facing humiliating defeats. Add another one to the list of Democrats on their way out the door. 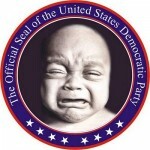 Democrats Whining & Attacking Pollster Scott Rasmussen as to Why America Against Democrat Agenda … That’s Your Plan? 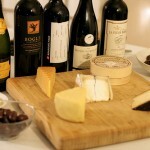 Hey Dems, how about some brie with that whine? Sorry Democrats, Liberals and Moonbats … you can whine all you want and rip Independent pollster Scott Rasmussen all you want. The fact of the matter is year in and year out he is the best and most accurate in the business. Funny how Rasmussen nailed the two 2009 VA and NJ Governor races in his polling, see below. Just out of curiosity to the LEFT, what part about these CNN, NBC/Wallstreet and Washington Post/ABC polls don’t you quite understand that show a positive polling rating for Obama? What a brilliant political strategy, attack the messenger of the polling data. We are supposed to believe that Rasmussen’s polling is the reason why American’s are rejecting Obama’s and the Democrats liberal agenda.? How much denial are Democrats truly in? You people are in a rude awakening come the 2010 midterms. So Democrats are attacking Rasmussen, good grief. Democrats cannot believe that there are poll numbers out there that do not paint Obama is a glowing light. Really? Have you looked at the other polls lately? 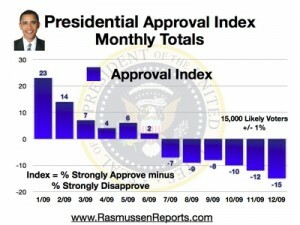 Have you taken a look at the Real Clear Politics average job approval poll from when Obama first took office? Of course Obama and Democrats poor polling numbers have nothing to do with a motivated and energized “We the People” known as the Tea Party movement who are tired of the Democrat controlled Presidency, House and Senate and the 10% unemployment, record federal debt, out of control spending, government take over of health care and weak foreign policy. They would like to have people believe that Rasmussen’s poll models are flawed. The fact is that they do not like the poll results that are then repeated in the media. It’s the Democrat playbook 101, when you don’t like the results or what people are saying … attack their credibility. Democrats, your act is tired and lame. What part about the Rasmussen Report has to do with this CNN & Gallup poll stating that Barack Obama’s poll numbers are sinking like a rock and Sarah Palin’s are on the rise? Democrats are turning their fire on Scott Rasmussen, the prolific independent pollster whose surveys on elections, President Obama’s popularity and a host of other issues are surfacing in the media with increasing frequency. The pointed attacks reflect a hardening conventional wisdom among prominent liberal bloggers and many Democrats that Rasmussen Reports polls are, at best, the result of a flawed polling model and, at worst, designed to undermine Democratic politicians and the party’s national agenda. What would one expect from liberal propaganda sites like Media Matters, the Daily Kos and Huffington Post? Anything that does not spew their liberal agenda and skew numbers to the advantage of politicians or policy that they support are going to be labeled Republican or Fox News-like.